This is the first of a series of cat posts. There will be a post with a variation of this cat and another post with a different model. If I get the time you’ll get to know even more cats! But, be aware, I can’t specify the time frame between posts! I’ll say no more since I’m owing some kusudama and flowers to the blog and to you, beautiful people who visit this blog even when I have so little time to update it. But I have a plan! To buy a transparent necessaire, or a neat transparent bag, for me to carry paper in the bus. This way while I travel back and forth I can fold units and put them somewhere where they are not squashed by my laptop or the books I carry. If I fold 5 units a day, and I use the bus at least two days a week, I can have a 30 unit kusudama in 3 weeks. Long? Yes, but I’m taking any available time to fold. Recently it’s a kusudama every 6 months, 3 weeks is no time at all! I do not like to read in the bus and I have no time to fold, or so I though, so this is a hour per week, minimum, to fold! I’m sharing because, who knows, there can be someone like me out there! You want to fold, you have no time, and then you realize that you may squeeze some folds while commuting from home to work or school or whatever makes you commute. I’ve seen people knitting so it’s not out of this world. And knitting needles can be dangerous. Paper is secure. You can’t even smoke in buses so it’s as safe as it gets! Oh, and I, or you, can fold while waiting for the bus! I love when I have these very basic yet grounded and obvious ideas. Author of the cat: 高井弘明/ TAKAI Hiroaki. About the cats: this is a simple version, there is another version, of a more detailed cat. I’ve learnt this cat, the simple, by unfolding a model used by a friend as an id plate. The one in the photo with the name. 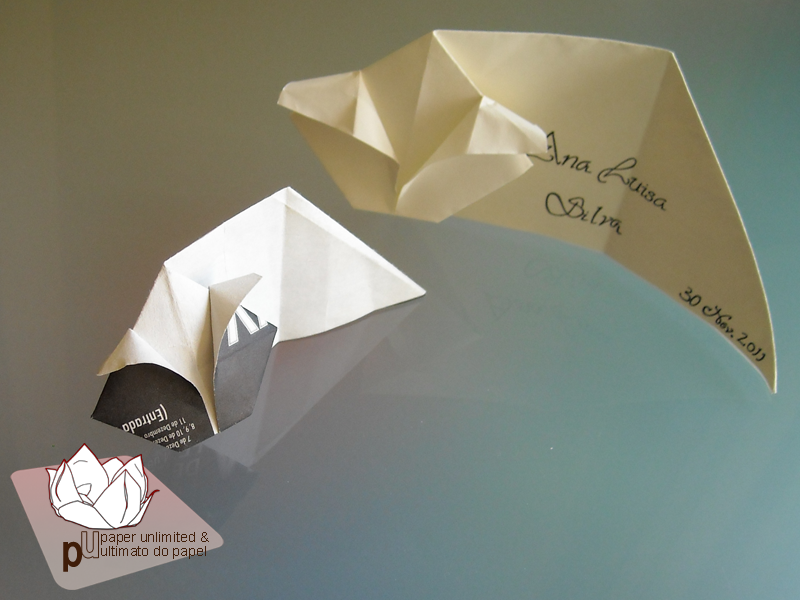 A friend of hers folded it, I saw it, took possession of it and tried my luck. I was lucky with the black and white cat. I then noticed that some folds were unnecessary and folded the calico cat. Then, by chance, I saw a image named “cat by Eric Bergmark”. It’s made on a dollar bill with quite nice results since the o of one serve as a cat eye. On a side note: Is it me or I’m being pursued by one dollar bills? You can see the post on the asian dragon for further enlightenment about me and 1 US$. Returning to the cat: I consulted a nice friend of mine named google and it revealed the cat’s author. It’s on the Origami USA page: the cat in a calendar, nicely folded and even better photographed. The google search also showed a standing cat so I tried folding it too: it’s the red cat. 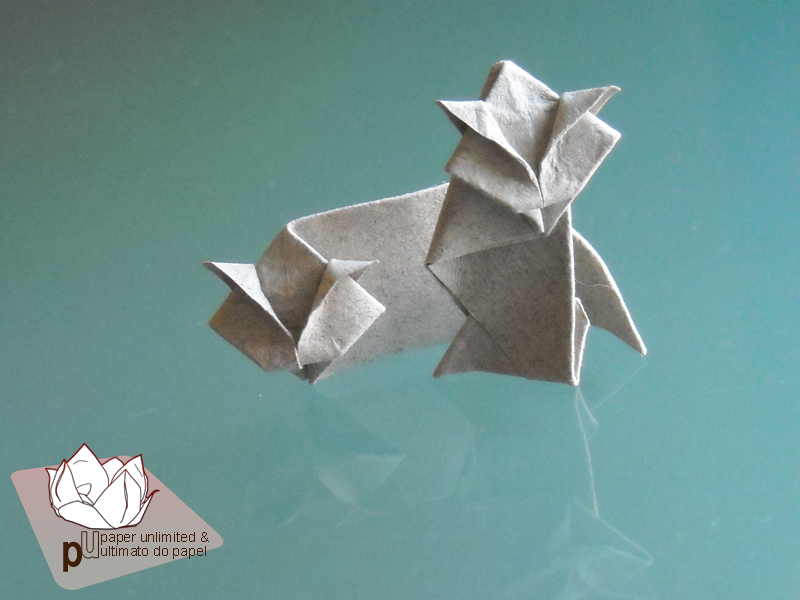 I also folded the cat from a square paper resulting in a kitten; when you control the paper sizes of different models it turns out quite nice! 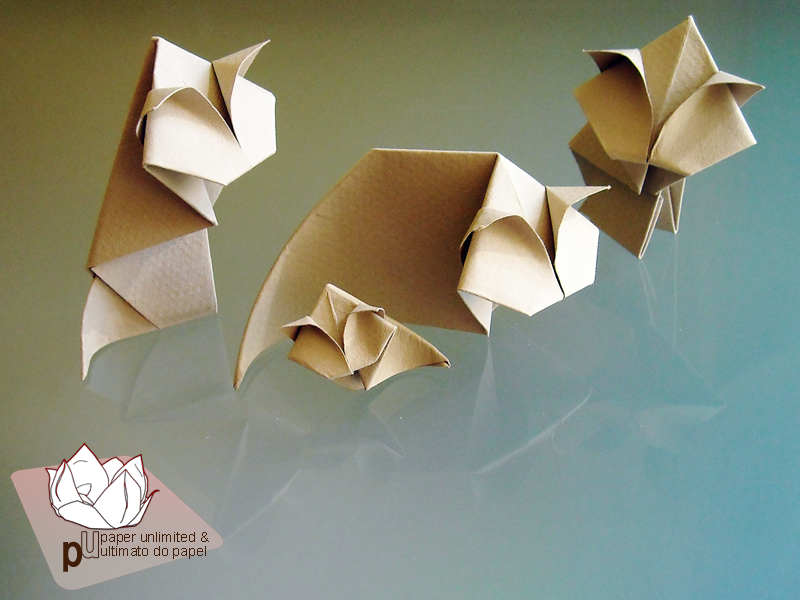 The almost white cats are wet folded and are made with heavy paper. 100grams per square meter. As you can see the back of the model holds no charm. Paper ratio: 1:1, or a square paper, gives you a kitten; a 1:1.5 ratio is fine for either the standing or normal cats. The normal cat can be made with ratios closer to 1:1. It depends on how you like your cats, longer or shorter. The light brown grayish cats are the last I made. I loved folding them! Made with wet folded canson. 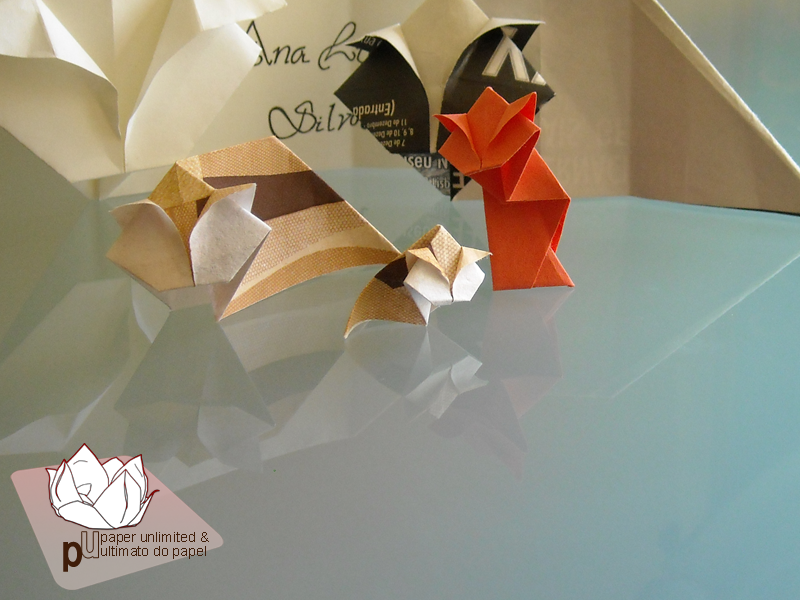 Kitten: paper is 5x5cm/ 1.96×1.96″; model is 2.5cm/ 1″ tall and 3.5cm/ 1.35″ wide. 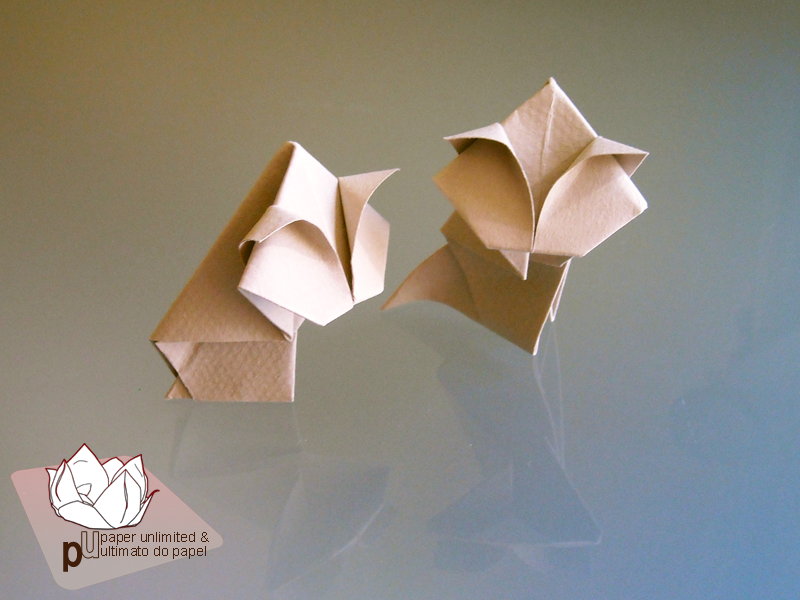 Normal cat: paper is 9x12cm/ 3.55×4.70″; model is 9cm/ 3.55″ tall and 4.5cm/ 1.75″ wide. The smaller side of the rectangle gives you control about the head size! The diagram is available online. It has japanese text but it’s so easy to follow that you can just ignore it! Link on the first phrase. I hope you like this cat. I’m going for simple things! The easier to fold, the better. Also, you may ignore my rumblings; but I hope they help you or somebody else! 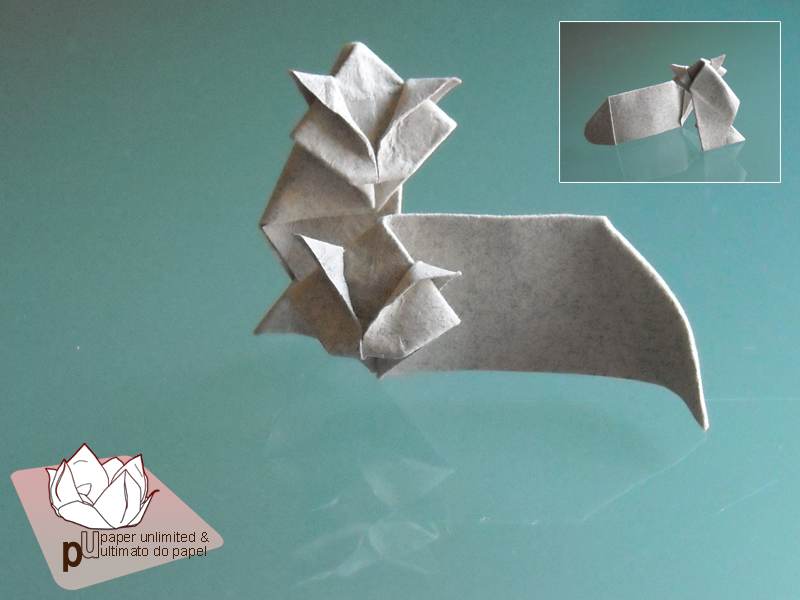 This entry was posted on 2012|02|25 at 18:31 and is filed under diagrams, origami, wet folding. You can follow any responses to this entry through the RSS 2.0 feed. You can leave a response, or trackback from your own site. hallo, I hope it is for you o.k., when I public one of your photos on my blog. I was thinking to write about paper and art … sonthing like this. Thanks… If you do not like it , let me now. As long as the image credits remains (the paper unlimited logo) it’s ok. And, of course, I appreciate that you’re telling me. 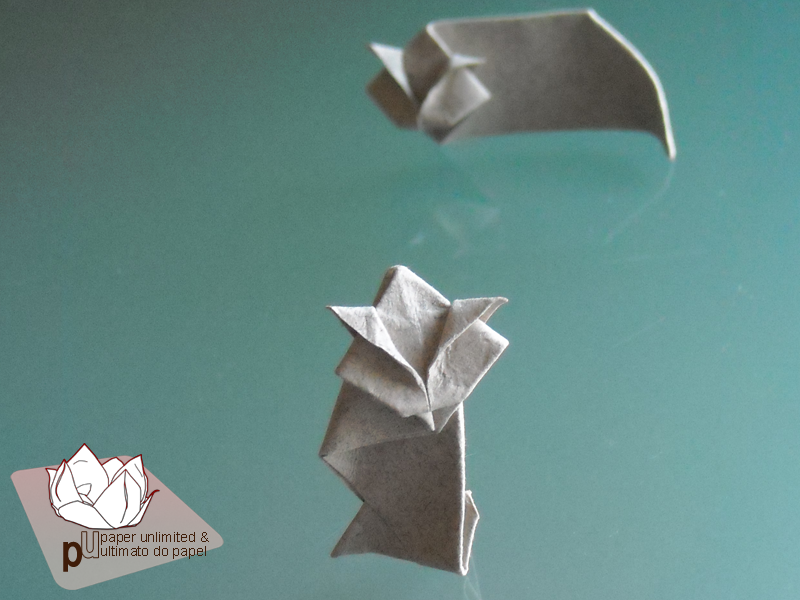 Thank you for spreading the love for paper folding.